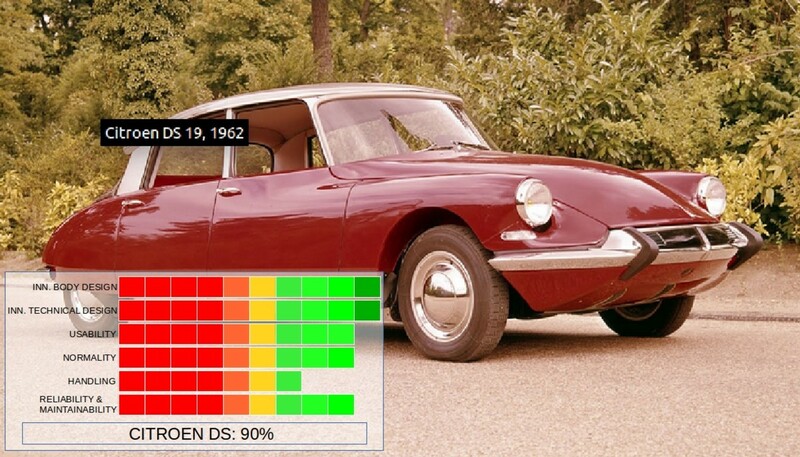 What Makes a Car Design Special? Here is a list of the ten best cars of all time, based on my own set of rules. There's no need to follow Jeremy Clarkson's rules! He mainly tests fancy sports cars, and is clueless about normal cars. From my youngest years on I've always been a car lover. I know almost anything there is to know about cars. You might wonder why there are no American cars in this list. Well, there is only one answer to this question in my opinion: European and Japanese cars are better. An interesting book with an alternative view on classic cars. The car has to meet all requirements of normal use. The more the better. It has to be a 'normal' car. Not some Topgear-like fancy sports car, or some other crazy looking vehicle. The car must have exceptional handling characteristics. The better, the higher the score. The car must be reliable and maintainable. The better, the higher the score. Only cars built after 1938 could join the contest, and there was one main reason for that: the Volkswagen Beetle. 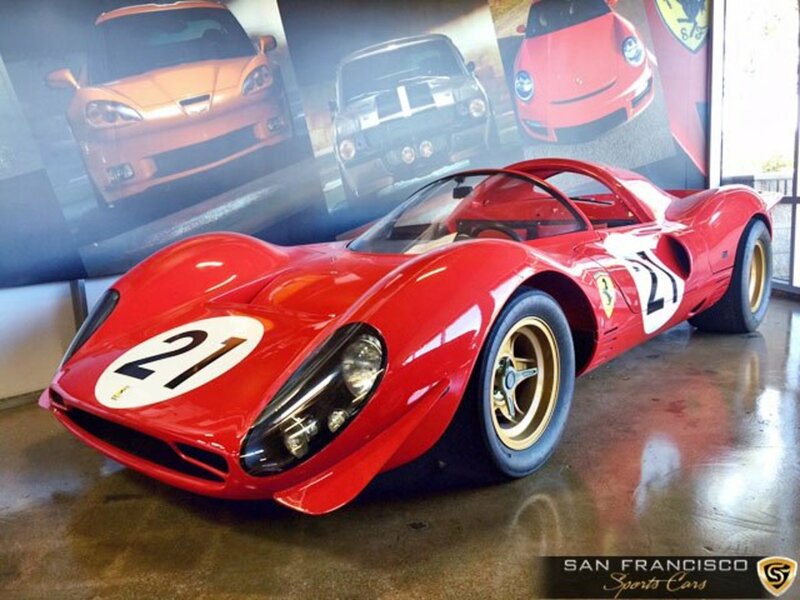 This car set a new standard in the car industry that still reverberates to the present day. Volkswagen sold more than 21.5 millions units of the Beetle. But the Volkswagen Beetle was excluded from this contest because this wouldn't be fair, since it is the standard, and would end at number one. That outcome would be too boring! So, the ten best cars are selected, based on the six features mentioned above. Why Is This One Not in the Top 10? 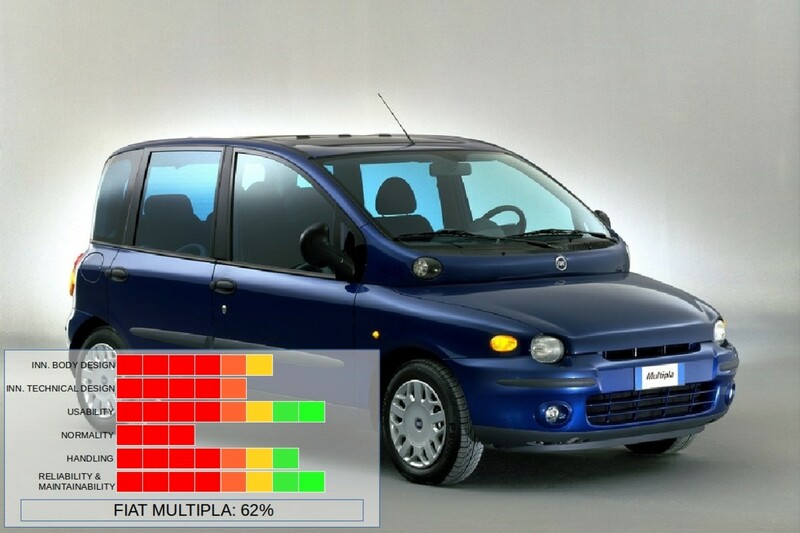 The Fiat Multipla is commonly accepted as one of the ugliest cars ever built. Ugliness played no role in this contest, which means that this car could actually be in the top ten. 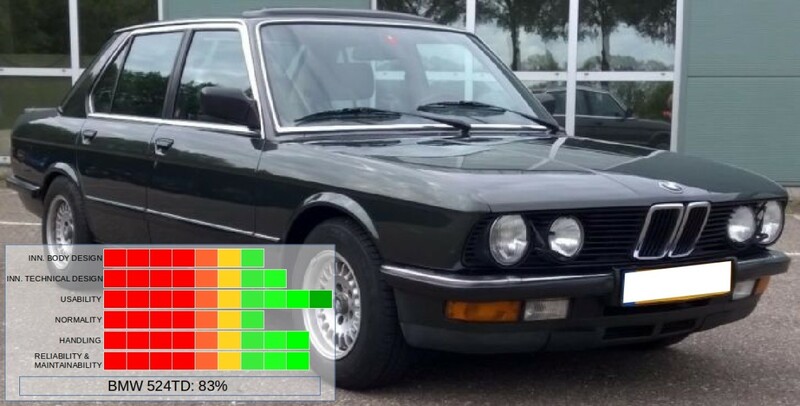 But because the car scores just 62% in the contest, it dropped out. 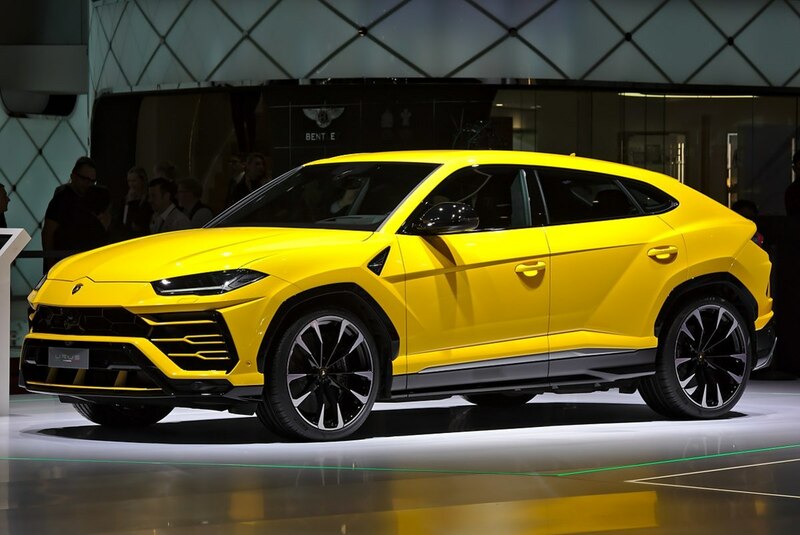 The concept is not innovative enough given the current state of technology, and the car has a very low normality rate given the fully irrational shape. And Why Not This One? The Porsche 911 drives very well of course, but this car is not good enough on all fronts. The 911 is too expensive to be good enough. It is not innovative enough as well. The concept of sports cars thrives too much on primitive egoic ideas. A 911 has a very low normality rate since it is still a head turner. It is no normal car. Furthermore is the technology and design not innovative enough and leans on an old concept. The usability is also very low, you cannot pull a trailer, stuff not much luggage, and is expensive in use. 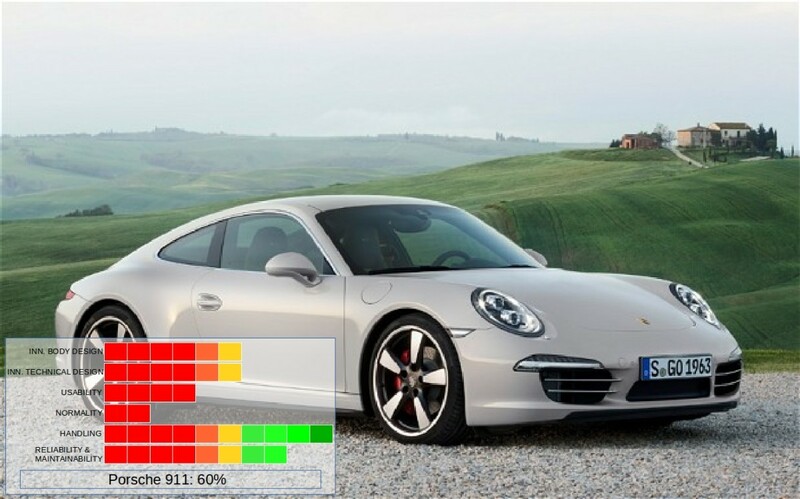 The Porsche 911 scores therefore just 60%. The Tesla S is a much better car than the Porsche 911, and also better than its direct competitor, the Porsche Panamera. The Smart ForTwo is an amazing concept. 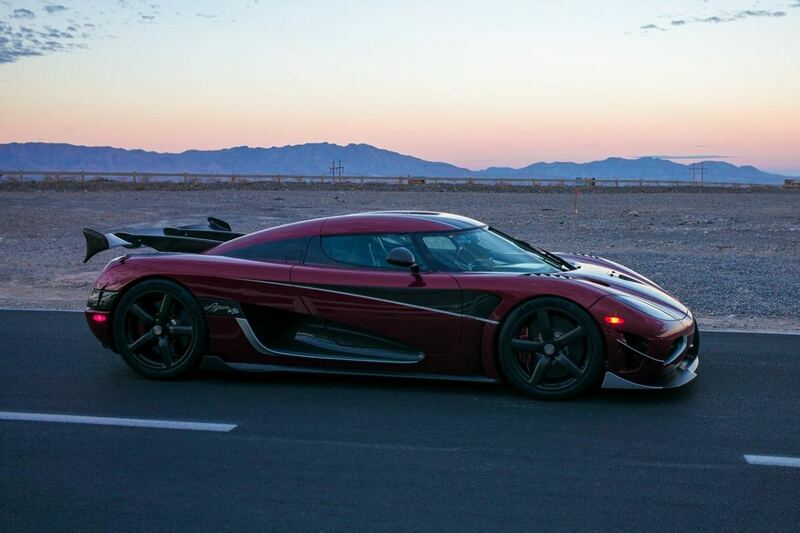 The car is only 8.85 feet long, almost half the size of a Mercedes S-series. Smart proved that a car doesn't have to be large to carry two people to its destination, without being unsafe. Besides capable of transporting two adults, it can take a limited amount of luggage, for example, two shopping bags. 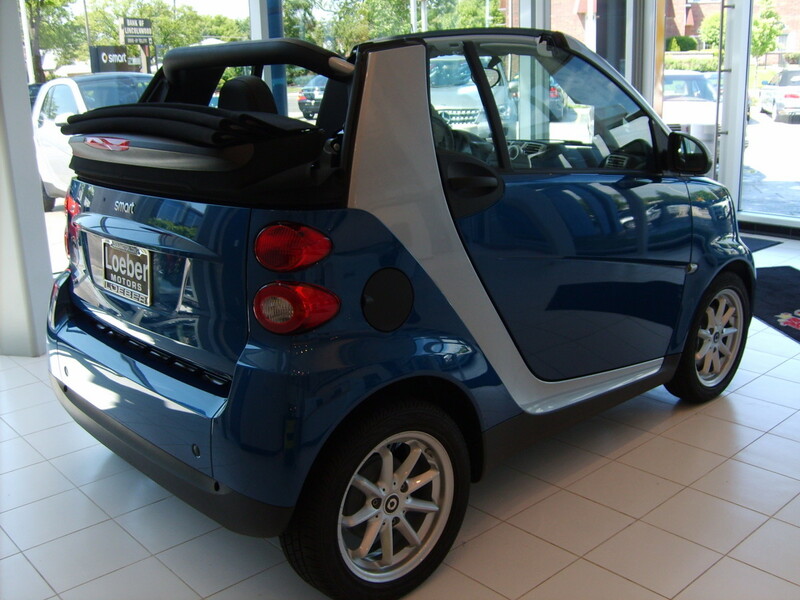 The Smart is also available in a cabriolet version. The Smart is equipped with a little 2-cylinder engine, and is even available in a version with a tiny diesel engine - the smallest diesel engine in a production car in the world. The diesel version runs 72 miles on 1 gallon. The petrol version about 43 miles on 1 gallon. 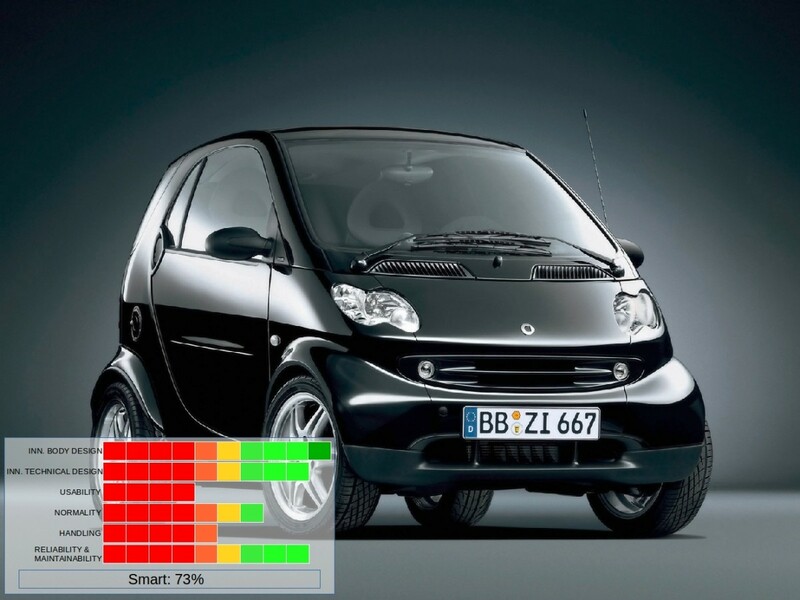 The safety of a Smart is simply amazing. Check out the video of the crash between a Smart and a fat Mercedes-Benz. This shows what a really smart design can result in. The Saab 9000 is not a winner on many aspects; it's simply a very good and very versatile car. The car is technically not inventive, except on motor development. One of the most amazing aspects of the Saab 9000 is the advanced engine management, even for the standards of today. Tests at the introduction of the Saab in 2002 revealed something remarkable. When the dirty exhaust gas pipe of a 2-stroke Trabant was connected to the air inlet of the Saab, the Saab was actually able to run on this awesomely dirty air, but even cleaned the air of the Trabant exhaust gases. That was an unseen achievement. The car is very safe and technically so reliable that it easily runs 500,000 miles without many troubles. The Toyota Prius was the first mass produced hybrid car. That was a revolution in 1997. The Toyota Prius is less versatile, because it is not allowed to mount a towbar, and therefore it's impossible to pull even a small trailer. When the combustion engine is still cold, it will start regardless you need it or not. The engine must be warm to act quickly as a main drive, when the situation requires this. The first few (cold) minutes of driving are always with the polluting engine running. The car has a fusiform shape to reduce wind friction as much as possible. 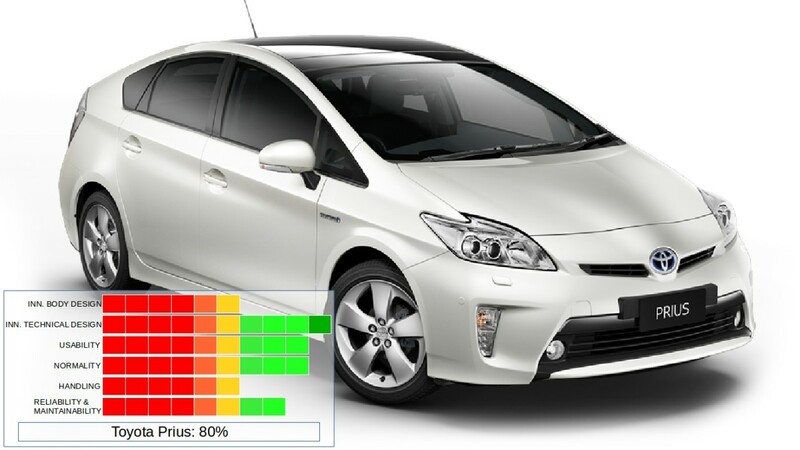 The Cd coefficient of the Prius is 0.28, and that's one of the lowest values among production cars. The Citroën 2CV, also called Deux Chevaux, which means two horses in French, is one of the most iconic cars of the twentieth century. The Deux Chevaux is a sort of cabriolet, a typical Mediterranean car, with no unnecessary luxury on board. At temperatures of below 23 degrees Fahrenheit, the very reliable and efficient 2 cylinder (air cooled) boxer engine, isn't able to heat the interior, no, not even the front window. The moisty breath of the inhabitants will freeze on the windows at the inside and leave not a single inch of sight for the driver. The horizontal strip that you see just beneath the front window is for the fresh air ventilation. The body parts are put together by screw connections. Replacing mudguards or doors is simply done by disconnecting a few screws. Even an empty battery is no problem, you can crank the engine with a lever. The 2CV is an extraordinary light car, weighing not more than 1250 lb. This light weight has also a disadvantage. With very strong side wind the Deux Chevaux simply slides off the road! 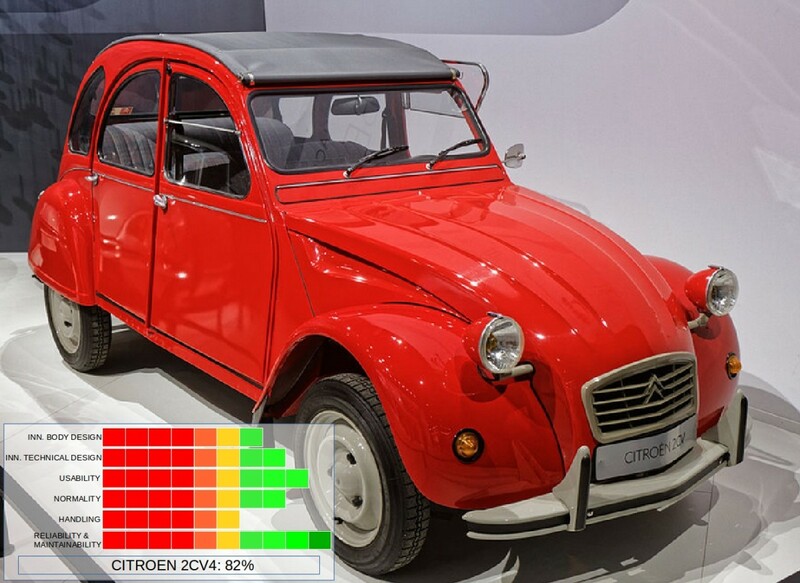 The road-holding capacities of the 2CV is one of the worst ever produced in the car industry. It is nevertheless a car that makes its passengers happy by its unbeaten simplicity and reliability. Simplicity triumphs. With this 6-cylindre, 115 hp turbo diesel engine, BMW redefined in 1984 the concept of the slow smoky diesel car. With this creamy running engine, was this BMW the first diesel car able to come along on the fast (unlimited) freeway lanes of Germany. BMW set a new standard for diesel engines for the next centuries to come, and is in fact today still dominant with superb both diesel and petrol engines. With a top speed of about 110 mph is this car, even for today's standards, certainly no loser. The road-holding capacities of this car is extremely good. This wasn't seen before in a diesel engine car. In fact, this car still beats most modern cars on pure driving performance. This BMW has an exceptional road-holding, thanks to its rear-wheel drive, and almost perfect 50/50 weight balance between front and rear wheels. A superb driving engine. Volvo excels in building safe and reliable cars. Volvo is the inventor of the 3 point safety belt, which is the most important security breakthrough in automotive history. The 3 point safety belt was first introduced in the Volvo 100 series in 1959. One of the best Volvo's ever built is the Volvo 244 DL, which is an evolutionarily developed car that sprang from the Volvo-100 series. 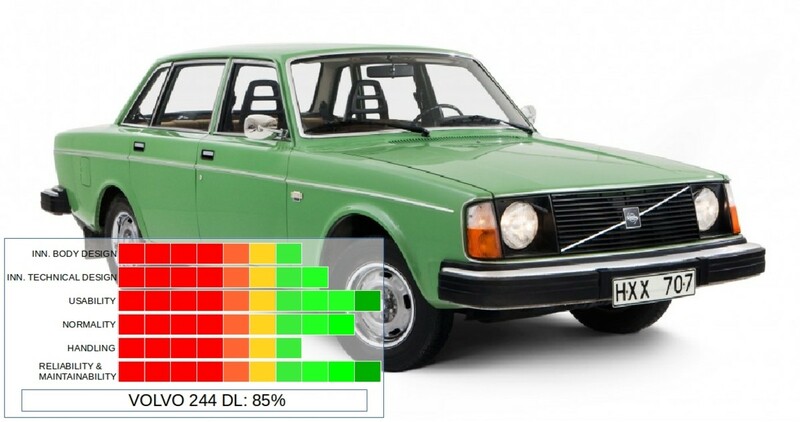 The first Volvo 244 DL was produced in 1974. These cars are still in use everywhere around the world. The Volvo was no highflyer in both body design nor technical design. The car is beautiful in its solid simplicity. This car is solid, uses simple technique, is very safe even for today's standards, although lacking typical safety features like airbags. The car is easy to maintain and utterly reliable. These Volvo's can easily make a few million miles without many technical problems, and that, is still an unbeaten record in the car industry. This car is the ideal son in law! Building an electrical car, like the Tesla S, for let's say $100,000 is not an art, that's for a meaningless elite. But building an electrical car for the mass, for every day life, for less than $25,000 is a marvel. That is what Renault did with its Zoe. Zoe is a small fully electrical car - a revolution in electrical driving for the masses. This car looks small, but it can transport four adults with a few serious suitcases in the back, and that is something the Tesla S is unable to beat, regarding its huge price and huge dimensions. 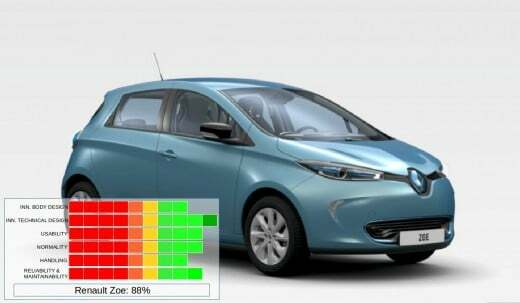 Most electrical cars have a range of action of less than 100 miles, and they are at least 50% more expensive as the Zoe. Not the Zoe, it has a range of about 130 miles. Only the Tesla S is able to beat this, but it has almost a double weight on batteries. The battery pack of the Zoe has to be rented. Some people might regard this as a disadvantage, but if that is really the case on the long term has to be seen. Not being the owner of the battery pack can also be regarded as less burden. The Citroën DS is an exceptional car in almost any aspect. Manageability was one of the weakest aspects of this beautiful car, although it was certainly good for that time. The large weight on the front axis in relation to weight on the rear axis, in combination with front wheel traction, caused the car to have a tendency to shift over its front wheels in fast lanes. On the other hand is the car very forgiving, so the driver can easily keep the car on track by releasing the gas paddle. The design is extremely aerodynamic. More or less like a droplet. The suspension was equipped with a hydropneumatic system, which made the car exceptionally comfortable, like sitting on a floating carpet. The designers were no experienced engineers. They were free thinkers and designers, which gave them an advantage over conventional engineers. Almost every detail on this car is exceptional and non-standard. From the directional headlamps (in later models) to the single spoke steering wheel. The car scores high on my list mainly due to its still unmatched aesthetic and technical design. For French standards is this car quite reliable, despite some troubles with the complicated suspension system from time to time. 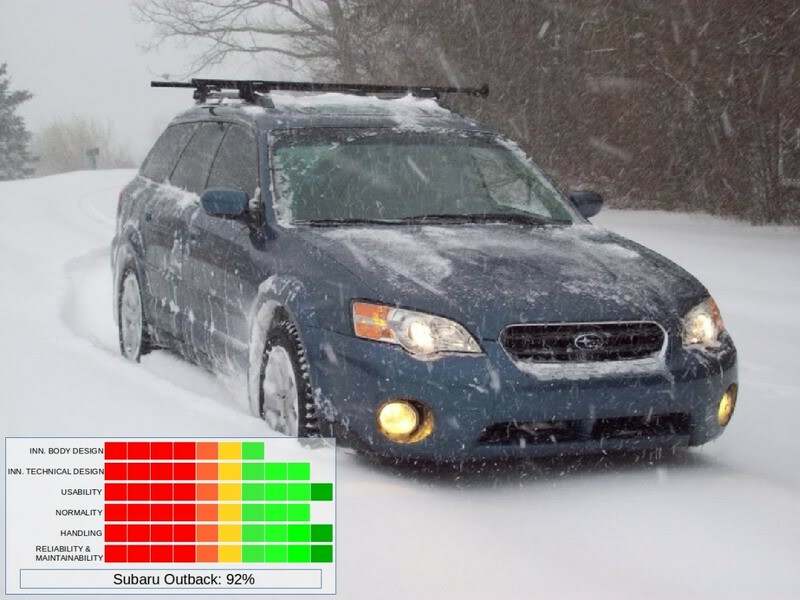 The Subaru Outback is often considered as a normal car, but it is not. It is awesomely good in almost any thinkable important technical aspect of a car. That this car isn't always the winner in contests is caused by juries who have no real knowledge of cars. With this car you might even forget that you have a car, because it's trouble free. Subaru learned its lessons in the World Rally Cup, in short WRC. What are really the most important aspects of a car when you're underway? Reliability, usability under all conditions and acceptable running costs. And that's boring for most car shows. Why is the Subaru my second best? Because this car is simply capable to take you anywhere you want, while the road-holding qualities are stunningly good, thanks to the permanent four-wheel drive. 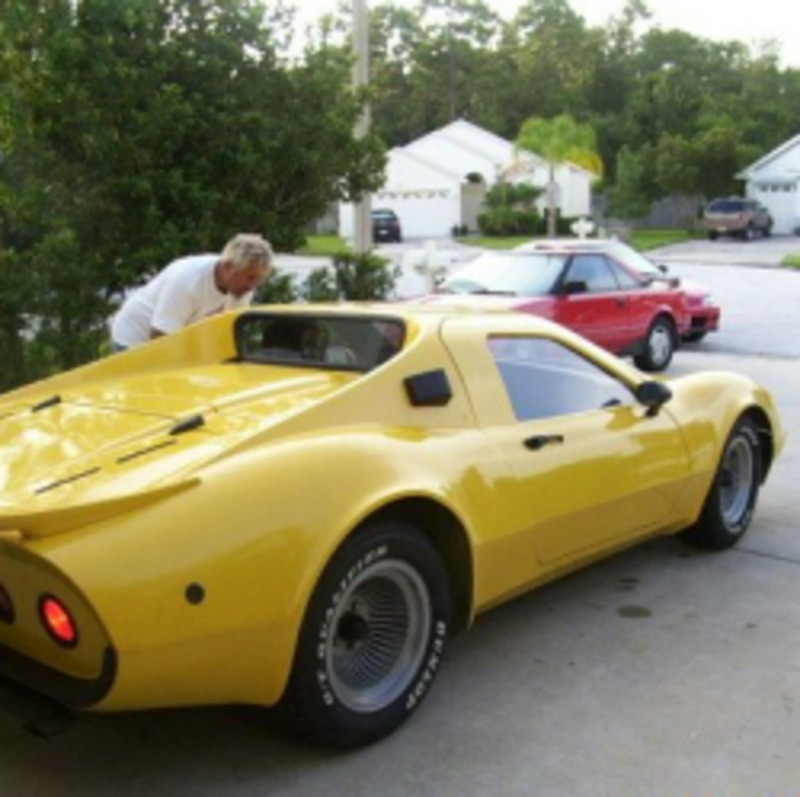 This car looks like a family car while it has the cornering characteristics of a sports car. Subaru keeps sticking to their own inveterate reliable boxer engines, that comes in petrol and diesel versions. These engines run blissfully smooth with their typical drumming noise. This car doesn't get stuck in the snow, and it takes easily a muddy trail. This car doesn't look bad either. Just a decent family car. You could hassle over little things like cup holders or other nonsense stuff, but that is really too unimportant. What to say more about this car? I'm not swallowed by emotions when I look at it, and that's a damn good quality of a car. Choosing a car should be rational and not emotional like all these Clarkson's do. In the end is your wallet rational too. 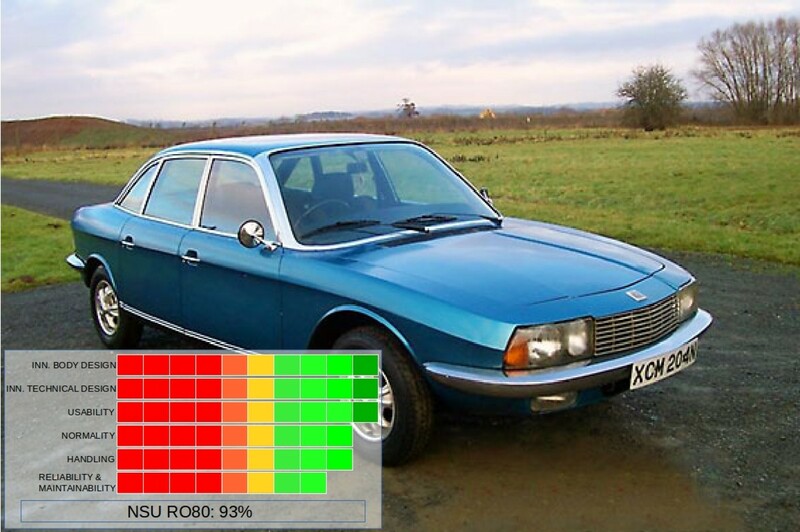 The NSU RO80 is an extraordinary car in all aspects. This car is a stunning beauty, both aesthetic and technical. The designers deviated from all standards by creating a car that was many decades ahead of its time. The car appears even for today's standards as modern. And that after nearly five decades! The car also has extraordinary good road-holding. The fuel consumption is though fairly high, which is the only minus of this car. The engine is constructed according to a total deviating principle - that of Felix Wankel. A normal engine has pistons. The Wankel engine has triangularly shaped rotors that run smooth and almost without vibrations. It only had in its early years one major problem. The rotor seals wore out too quickly. This problem was solved in later models, but the bad name was already set, and the production was shut down in 1977. The myth around the bad Wankel engine still hangs over this car, but engineers solved this already long time ago. The engine is now very reliable, and the car has a good maintainability in general. When you're in the position to purchase a good one for a fair price, don't hesitate one moment. This car is even for today's standards one of the best cars ever built. The Volkswagen Beetle is almost beaten by this (also) almost perfect German creation. Which Car do YOU Like the Most? 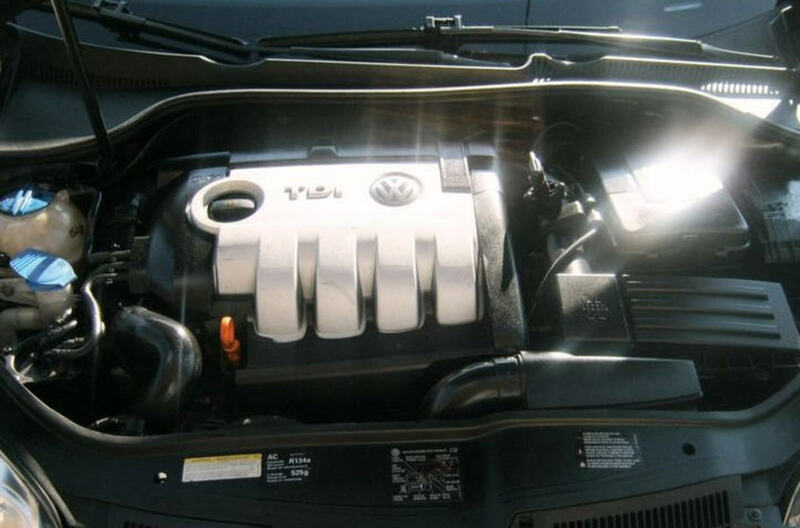 Does Your VW TDI Diesel Engine Hiccup or Hesitate When Accelerating? The 2012 Model S represents the single greatest leap forward in automotive design, perhaps even in the greatest leap forward for any single new product. 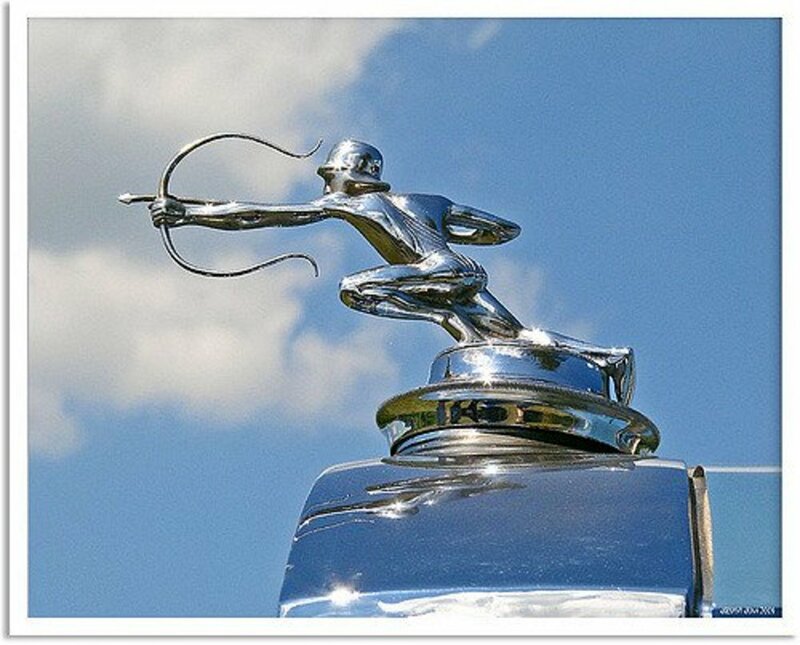 That was the moment 100+ years of automotive industry was turned on it's head. And - most astonishingly - most of the world is still sort of unaware of it to this day. But that realization is coming now, like a tsunami. I wrote: " Building an electrical car, like the Tesla S, for let's say $100,000 is not an art, that's for a meaningless elite. But building an electrical car for the mass, for every day life, for less than $25,000 is a marvel." If I made my own list, I'd put one American vehicle on it and this one would be at the top. The Jeep Cherokee Sport/XJ is a remarkable vehicle. It was the forerunner of the modern SUV, but was always considered to be a station wagon. I'm not familiar with many of the cars on your list, but they are all impressive. I like your six specifications, especially that it has to be a normal car with an innovative, technical design. Good job on this hub. Thanks for reading and commenting, ChitrangadaSharan! I hope your husband and sons appreciate this list, although it has still subjective despite sides, despite the objective efforts. That's an interesting list and I enjoyed going through. My husband and two sons are crazy and quite well informed about cars and do not miss any exhibitions about them. Passing this on! Thanks for sharing this informative and interesting hub. Voted up! Thanks for reading and commenting, Suraj Punjabi. Of course you may know this:) There is actually a kind of Mercedes in the list, the Smart. I doubted a lot whether or not to include a Mercedes (the real ones), but they simply didn't matched the BMW. The BMW was more ahead of its time and more sophisticated in the technical details than the Mercedes. None of the Mercedesses actually made it in the top 10. In my opinion: solid and sophisticated, but too conservative. Nice article. I love cars. May I know why Mercedez-Benz did not enter the list? Aren't they in the similar price range of a bmw? Thanks for reading and your contribution, Ann. I fully agree with your view :) Cheers! I've had a Smart car; fun to drive but only for one! For me, the Outback is the best because that's what we have at the moment and it's the best car I've ever driven. Second comes the Forester. The original Porsche 911 was wonderful and the G-force something else! I find the more modern ones are not so pretty. The 2CV is an icon, along with the Mini (the original, not the huge new one!) and the Beetle was amazing, though unstable! Thanks for the great comment, Nell! I had to laugh about it :) The Beetle is simply unbeatable. The modern version of the Beetle doesn't come close to its forefather, and that might be even an impossible task. I love the way you put the Beetle at the top, my favourite car of all time! If I could afford a car, which I can't at the moment, or should I say ever, I walk everywhere.....lol! I love the beetle, in fact I used to work for volkswagen! great list and my partner is peering over my shoulder as we speak! lol! That's very true, Yoleen. It's indeed a great car. According to the German research institute TÜV, this Toyota Camry is among one of the most reliable cars. Thanks for reading and commenting! The best car I ever owned was a 1995 Toyota Camry. It rarely had issues during the 9 years I owned it. It had 115,000 miles when I bought it, and I drove it up to 355,000 miles! Get this - the air conditioning still worked! Thanks for reading and commenting, peachpurple. It's not unusual that you've never seen them in your whole life, although from the top 3 the Subaru is the most common one today. The NSU is nowadays a rare oldtimer, only for the real enthusiasts. The cooling system is awesome indeed, but the 2CV has also the same kind of engine, a boxer engine, with air cooling, pushrods and very edurable. The 2CV has only has 2 cylinders, where the Beetle has 4 cylinders. The 2CV was also in the 'Sahara' edition. It has 2 engines, one in front and one in the back and has 4WD! I've not seen a list like this that doesn't have the Beetle somewhere in the top 3. It's funny how terminology varies. In my part of the world we call them Bugs as much as we call them Beetles. There still aren't many cars can compare with the Beetle. From its cooling system to its efficiency to its ability to do well in about any weather condition to its reasonable price tag. It's indeed too bad it was initiated by Hitler. The Beetle on the other hand is among so many other things that originated from the technological superior Germans. The history showed clearly that superiority doesn't mean you're the winner, maybe because this superiority often goes hand in hand with insanity. 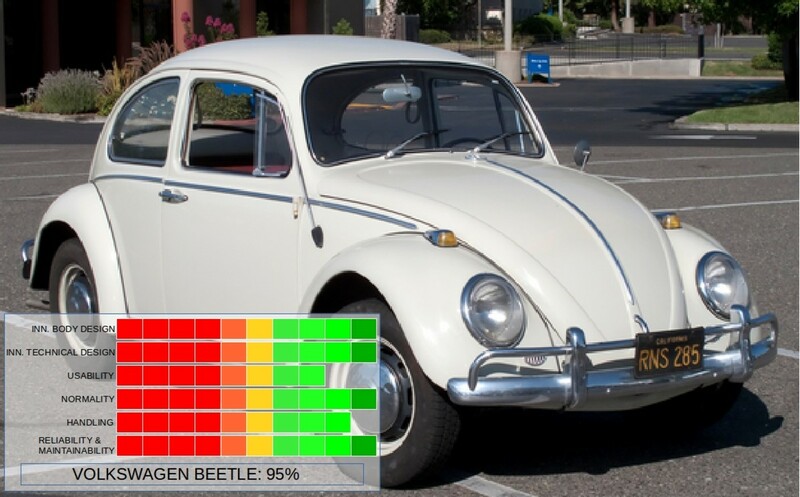 On a lot of levels the Bug is one of the most innovative cars to be produced. To bad it was originally commissioned by Hitler. 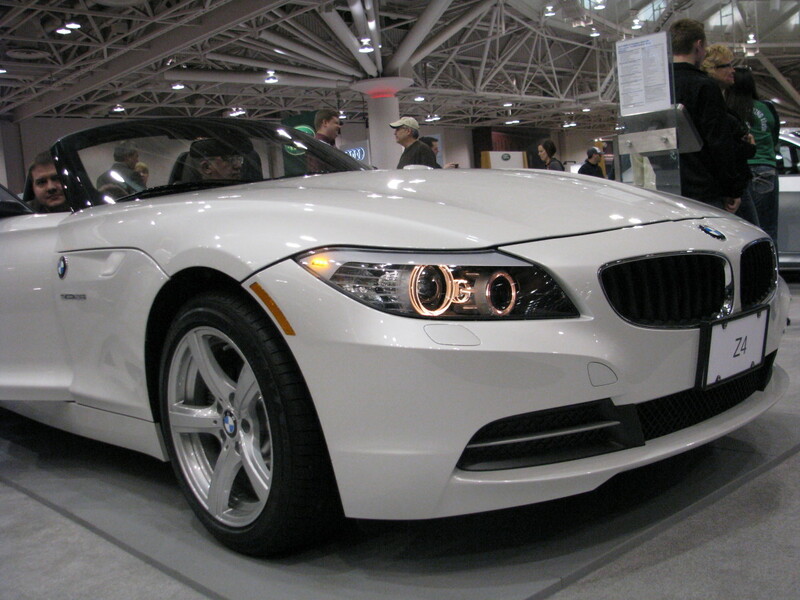 To be honest there are also to my taste a few cars I don't really like, like the Prius, the BMW. But I tried to make the list as objective as possible, while I know that objectiveness is quite a struggle when it comes to cars. I'm looking forward to your list of iconic or beautiful cars! I like the top 3, but not much else. I see you've put a lot of thought into it though, and know more than I do about cars, so I'm not going to disagree. I'd like to see a top 10 beautiful cars, or iconic cars. I'm tempted to do that myself. I think the Porsche 911 would probably make it then. Of course, quicksand! In your imagination everything is possible :) Thanks for visiting and commenting. You know lots about other things, Bill :) This list was also fun to make. Thanks for dropping by, my friend. Thanks for dropping by, PaigSr! The TR3 is a nice car too :) Great choice. From this page I would go with the VW Bug. Personal choice would be a TR3.